Built in 1997, by Tri Star Marine Incorporated of Seattle, Washington (hull #109) as the Cosmic Wind for Cook Inlet Tug and Barge Incorporated of Anchorage, Alaska. A division of the Anderson Tug and Barge Company of Anchorage, Alaska. 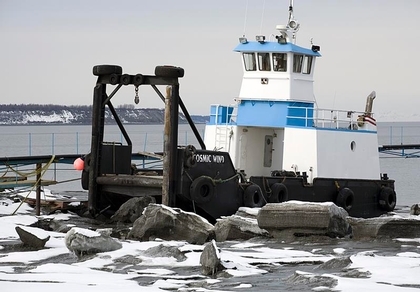 In 2013, Cook Inlet Tug and Barge Incorporated was acquired by Foss Marine Holdings of Seattle, Washington. Where the tug retained her name. In 2016, the tug was acquired by the Hamilton Marine Construction Company of Anchorage, Alaska. Where she was renamed as the Bully Dog. Powered by two, Caterpillar 3412 diesel engines. With Tonako Marine reduction gears. She is a twin screw tug, rated at 1,100 horsepower. The tug's capacities are 7,000 gallons of fuel, and 1,000 gallons of water. Ship Builder: TRI-STAR MARINE, INC.